I thought it would be really fun to share my Christmas cards with you this year (since I already mailed them). 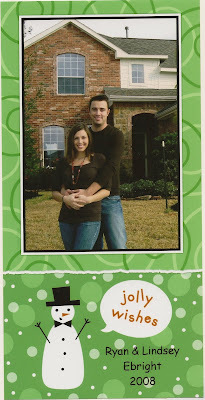 This will be Ryan & I's fourth Christmas being married and fourth Christmas card together. I was VERY ambitious the first year. :) I made all my cards from scratch, and they were all a little different from each other. It took me days to finish. I even stamped the envelop front and back! 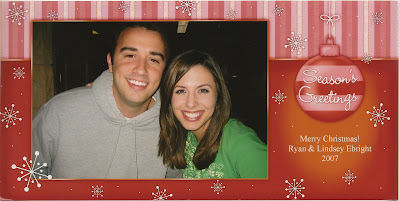 That will not be happening again... Ryan even wrote a sweet Christmas letter about our first year together to include with our card. When I ran out of paper and still had people I needed to give Christmas cards to, I went to Wal-mart and made these. They were mainly for our coworkers. The next year I found a design I really loved from Stationery Style. It opens up and inside was printed, "May the joys and blessings of Christmas be yours throughout the year!". I absolutely loved it. 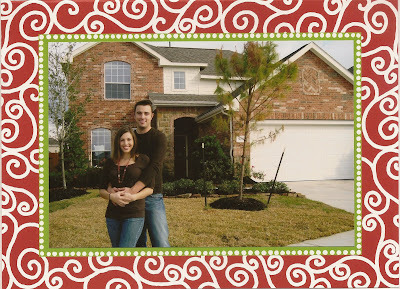 Ryan & I had just moved back to Houston and bought our second house. So I thought it would be perfect to put picture of us in front of our new home. Again, I ran out of the ones I had ordered from Stationery Style. So I just popped over to Wal-mart to have some additional cards made. I think they turned out cute. Finally, we are to this years! I broke the tradition of having two cards. :) However, you are probably going to choke when you read this... I ordered 150 cards!! I didn't want to run out again but I may have a few left over now. Does anyone want me to send them one? If so just let me know and give me your address. 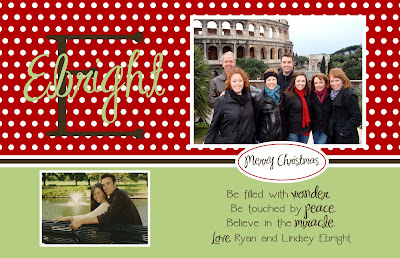 :) This year our big trip was to Italy with our family so I had to incorporate a picture from there. I couldn't find a picture I liked of Ryan & I. So I resorted back to an engagement picture. Ha! After I approved the design I remembered the pictures from my first Texans game! Oh well. This year A Piece of Pope made my cards, and she was so easy to work with and fast. 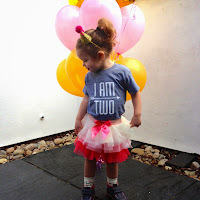 Her designs are fabulous too! I also thought I would share with you where we keep all our photo Christmas cards we get every year. Luckily, I had kept all the cards we had received since we got married but I had no where to put them. My good friend, Lindsey, gave me this idea to just put them in a scrap book type album. Super easy! Now, every year I can pull this out and flip through every one's cards. It's such a sweet reminder of years past. Even guests like to look at it! I want to see all of your Christmas cards so let me know if you post them! Oh my gosh, great Christmas cards! I love your idea of keeping them through the years. Hmmm... may have to steal it. Love all of your Christmas photo's and cards!!! 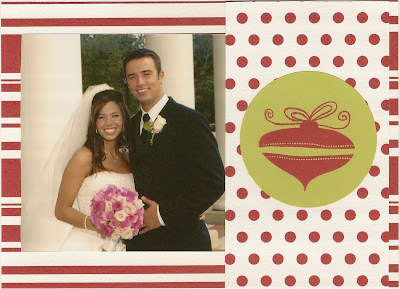 I love the idea of putting the Christmas cards you get into a scrapbook - such a neat idea! 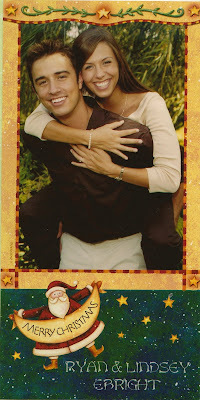 I posted some old Christmas card pictures a few days ago!! How cute! I wish I would have kept copies of ours..thats such a good idea! I designed mine and so did Rachel. You'll be seeing them on the blog soon! You are such a thoughtful person. I love how you keep all the pictures through the years. It is also fun to look back at one family and see how much their children have grown through the years. I love all of your cards. The NYC with the skyline is perfect. I hope you have that one blown up and on the wall. It is beautiful! I LOVE them they are super cute!!! All of yours are adorable throughout the years. This is our first year to do Christmas cards and I am so excited for everyone to get them!!! The scrapbook idea is really cute. I wish I would have started doing that 8 years ago! Maybe I will start now. Beautiful cards and such a great idea with the scrapbook! Love all of your cards...and I love your idea of a scrapbook! I think I will start one this year. all of your cards have always turned out great!! i totally love the idea of having a scrapbook to keep all the cards in!! i never know what to do with mine and i don't like tossing them. I LOVE LOVE LOVE your Christmas cards!! Everyone of them has been great!! Y'all are such a good looking couple!! (Hope you don't mind me saying that! :)) We have got to set a date in January to meet for dinner!! 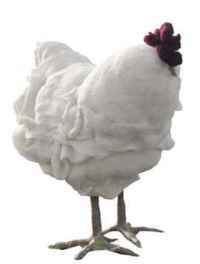 I AM SO STINKING SERIOUS!! let's do it!!! How cute are y'all?!? Love all of your cards, especially the one for this year. Thanks so much for joining in the fun! Merry CHRISTmas to you!!! What a beautiful card (and home, too! )...I sure hope you've got printed labels for those 150 envelopes- yikes! Ha! Great cards Lindsey! I wanted to start the tradition of sending out Christmas cards too once Jason and I got married, but we didn't get around to doing it last year. I did get them done this year though and plan to do it year after year. I'll post mine on my blog in a few days. :) I love the idea of the scrapbook too!